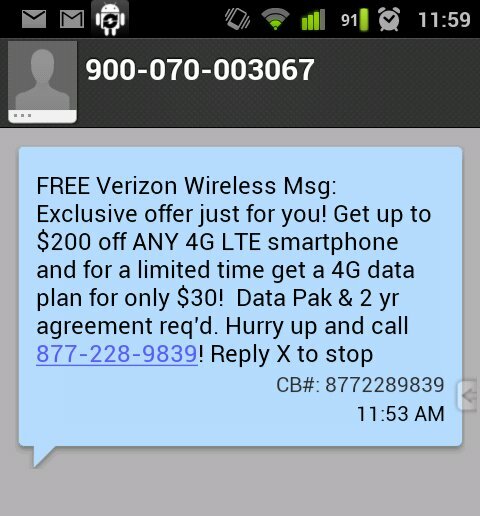 Verizon Offers $200 “Exclusive” 4G LTE Smartphone Discount to Select Customers? With no major smartphone releases happening until the end of March or early April, Verizon has instead temporarily moved into the deal business. Last week it was a Leap Day sale of $100 off all 4G LTE phones. The week prior to that we saw a regional discount for free Galaxy Nexus devices. And today, some readers are receiving texts messages that mention an “exclusive” $200 discount for any 4G LTE smartphone that Verizon offers. We reached out to Big Red to see if we can get additional details on the promo, so sit tight and try not to bombard their customer service with calls. It’s likely regional and the same as the free Nexus promo – only available to select VZW customers that meet a handful of criteria. Update: This again appears to be a south region promo. Verizon has made it clear that you cannot call in to receive the discount. If you qualify, they will let you know. Google Decides That "Key Lime Pie" Will Follow Jelly Bean in the Android Naming Scheme?